“Uncertainty and taking risks … is at the heart of peacekeeping,” the former head of United Nations peacekeeping, Jean-Marie Guéhenno, remarked at the International Peace Institute (IPI) in July, where he recounted the experiences detailed in his recently published memoir, The Fog of Peace (Brookings Institution Press, May 2015). With peacekeeping as one of the most visible and critical activities of the UN, analysis of its core responsibilities also goes to the heart of stabilization efforts more broadly, whether it is stabilizing fragile states; ensuring the protection of civilians; adapting to increasingly asymmetric environments; or enhancing regional and multilateral cooperation. In the first of a new series of recommended reading from IPI staff, the focus this time is international peacekeeping, and Mr. Guéhenno’s book is one of many new titles on the topic that have made timely appearances on bookshelves, coinciding with the growing spotlight on peacekeeping activities. Calls for reform to strengthen peacekeeping’s operational capacity and efficacy culminated in the much-anticipated June release of the comprehensive review by the High-Level Independent Panel on UN Peace Operations. There have also been persistent pleas for accountability and transparency in light of unsettling revelations of sexual misconduct by UN contingents in the Central African Republic, Haiti, and elsewhere. Mr. Guéhenno oversaw the largest number of peacekeeping deployments in UN history as head of UN peacekeeping from 2000 to 2008. His book offers an unparalleled first-hand account of the challenges facing peacekeeping operations today, and why peacekeeping remains not only the UN’s “flagship” enterprise—as Secretary-General Ban Ki-moon once termed it—but also one of the most contentious. In addition to Mr. Guéhenno’s account, navigating through this “fog of peace” is a common theme underpinning the following new publications that explore peacekeeping’s challenges and opportunities. A reliable compass for the journey can be found in the detailed and exhaustive account of peacekeeping in The Oxf ord Handbook of United Nations Peacekeeping Operations (Joachim Koops et al., eds., Oxford University Press, July 2015), which offers a thorough analysis of all 67 UN peacekeeping operations launched between 1948 and 2013. The handbook weaves together a series of chronological chapters that begin by covering thematic perspectives on key issues, such as humanitarian interventions and peacekeeping’s role in relation to international law. It then turns to an impressive critique and examination of every individual peacekeeping operation in UN history, their evolution, and impact. The forthcoming United Nations Peacekeeping Challenge: The Importance of the Integrated Approach (A nna Powles, Negar Partow, and Nick Nelson, eds., Ashgate, September 2015) provides an insight into the difficulties the UN faces in improving peacekeeping. 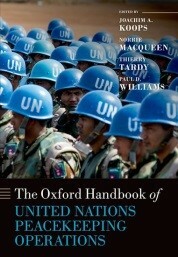 The book contributes to the debate on reform through select chapters addressing combat- and non-combat-related responsibilities placed on land forces, ways to advance unity of effort in operations, localizing ownership of security, as well as less discussed but increasingly prominent topics affecting deployed UN personnel, such as mental health and the treatment of combat veterans, duty of care, and safety and security. 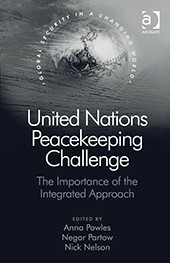 The common argument that UN peacekeeping often operates “in places where there is no peace to keep,” is taken up by Spoiler Groups and UN Peacekeeping (Peter Nadin, Patrick Cammaert, and Vesselin Popovski, Routledge, February 2015), which offers policy proposals for UN missions operating in hostile environments, understanding the duality of nonstate armed groups in modern warfare as both protagonists and antagonists, and addressing robust peacekeeping and the protection of civilians. With 70% of all UN peacekeeping occurring in Africa, literature on activities in the region is not in short supply. However, several recent books manage to cut through the swath of commentary by offering fresh perspectives on long-standing operations, including the missions in the Democratic Republic of the Congo (DRC), Mali, Darfur, Sudan/South Sudan, and Somalia. By placing peace operations within the context of the growth of an African security architecture, Peacekeeping in Africa: The Evolving Security Architecture (Marco Wyss and Thierry Tardy, eds., Routledge, paperback August 2015) pushes the debate toward an analysis of the “constellation” of peacekeeping actors from international and African regional organizations, as well as the often overlooked strategic prominence of African countries among the rising powers of China and India, the peacekeeping policies of these emerging actors, and their impact on the ground in Africa. In a similar vein, Cooperative Peacekeeping in Africa: Exploring Regime Complexity (Malte Brosig, Routledge, October 2015) assesses how the African security “regime complex” could enhance cooperative peacekeeping. This complex includes the UN, regional international organizations such as the African Union, economic communities, the European Union, and the continent’s lead nations of South Africa, Nigeria, France, the United Kingdom, the US, and China. The book also explores the exchange of resources among these actors through case studies of Somalia, the Central African Republic, and Mali. 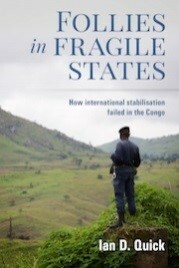 Narrowing the focus to a single state, Follies in Fragile States: How International Stabilization Failed in the Congo (Ian D. Quick, Double Loop, June 2015) provides an eye-opening critique of international stabilization efforts in the DRC. Based on original research conducted in DRC, the author argues that the efforts were unfit for purpose. Mr. Quick boldly claims that the very concept of “eastern DRC” is a fictional entity resulting from an ill-conceived understanding among international and peacekeeping actors in the region. He makes a compelling yet disquieting argument against this level of abstraction to correct what he terms the “follies” in the region’s policy process. Recommended responses include advancing what he claims has been absent from the international response: widely shared, demand-driven goals based on accommodation of regional and local differences; effective pathways for change; capabilities and contributions to create public value; and a more inclusive policymaking process. The complexity of the DRC crisis is also the subject of a report from Netherlands-based think tank Clingendael, “Going Around in Circles: The Challenges of Peacekeeping and Stabilization in the Democratic Republic of the Congo” (July 2015). The report explains the background to the conflict, the dynamics between the Congolese government and the UN peacekeeping mission (MONUSCO), how they have influenced each other, and the nature of conflict and disengagement. It argues that the international community and MONUSCO have been unable to counter the cyclical nature of conflict in the DRC, which has led to inefficient interventions based on technical rather than political calculations. If, as Follies in Fragile States and the Clingendael report imply, stabilizing the DRC is an operational thorn in the UN’s side, then effectively protecting civilians in the region risks becoming a legal albatross around its neck. An IPI report, “The Intervention Brigade: Legal Issues for the UN in the Democratic Republic of the Congo” (November 2014), examines the sensitive legal issues facing peace operations in the DRC, particularly around the protection of civilians, use of force, and peacekeepers’ obligations and defense under international law following the deployment of the “intervention brigade,” the UN’s first overtly offensive combat force. The report also addresses the question of whether the UN could be considered a party to the conflict in the DRC. To complete the current snapshot of international peacekeeping, the latest installments in IPI’s Providing for Peacekeeping series focus on issues of safety and security, Europe’s contribution to peacekeeping efforts, and operational partnerships. 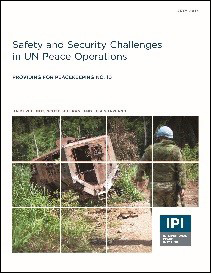 “Safety and Security Challenges in UN Peace Operations” (July 2015) outlines the evolving and increasingly hostile security context into which operations are being deployed and its implications for personnel. The report assesses existing UN management structures, policies, and processes to identify potential areas of reform. “Europe’s Return to Peacekeeping in Africa? Lessons from Mali” (July 2015) analyzes the European return to peacekeeping in Africa through a case study on the UN mission in Mali (MINUSMA), which offers lessons for other Western states looking to contribute troops, including the need to adapt to the UN peacekeeping system, respect domestic political concerns, and forge partnerships within the mission. It also advocates the potential of European military contributions to strengthen UN peacekeeping operations facing capability constraints and to assist the UN’s ability to learn and adjust to asymmetric threat environments. Published just this month, “Deploying Combined Teams: Lessons Learned from Operational Partnerships in UN Peacekeeping” focuses on lessons from deployments that use operational partnerships. Through case studies of the Lebanon and Cyprus UN missions, it assesses the major benefits and challenges of operational partnerships for UN peace operations at both the political and operational levels. The complete Providing for Peacekeeping series can be accessed here or on the IPI publications website. Marisa McCrone is Assistant Production Editor at IPI.